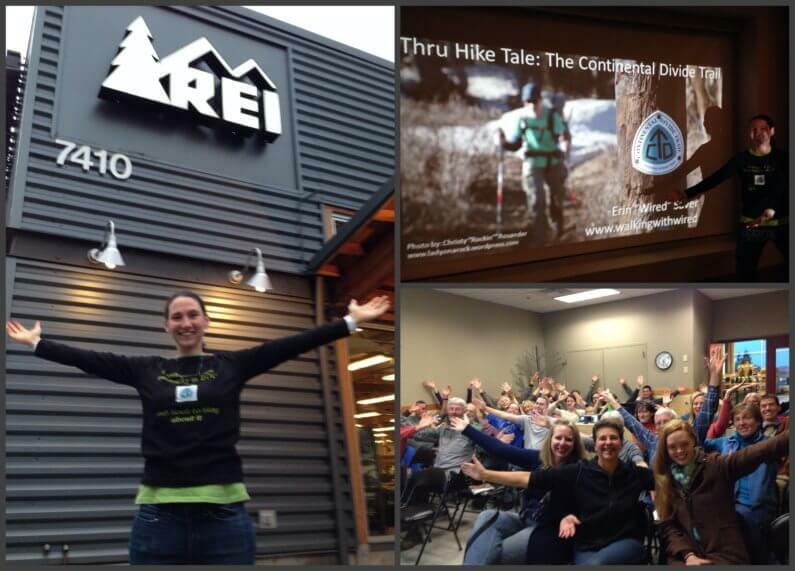 Presenting for REI at their Lucky Lab NW events. Great location! It’s presentation season again! 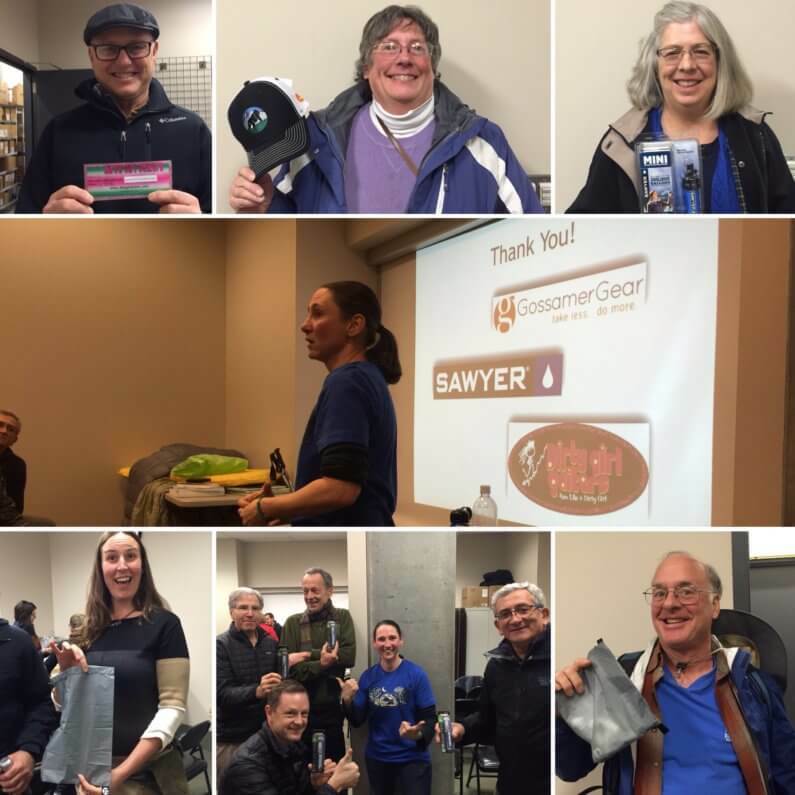 I was bummed to have missed my yearly presentations while I was in Australia and New Zealand last fall and winter. Although it is a lot of time consuming work to put together the presentations, it is a much valued process that I get to go through. Going through the blog and photos in detail after the fact really helps me to absorb all of it and revisit everything that I saw and experienced. I went back on some of my old presentation photos for this post, and got sentimental, so here’s a handful of memories from past presentations. Many people ask if I experience that post-trail depression that many feel when they return home. I feel like this process of presenting is a big part of why I don’t. I love going on the hikes again virtually through my own blog and photos just as an outside reader would. It’s pretty great to hike again from the comfort of my home while it rains outside. Looking back also reminds me of how much I love what I get to do out on the trail, and it motivates me to eventually do that dreaded planning for the upcoming hiking season (this spring to Nepal to do the Great Himalaya Trail, then probably back to Europe for the summer). Part of the fun is doing a raffle and giving out goodies from my awesome sponsors! An annual favorite of mine is presenting at the Trails Club of Oregon Annual Weekend Backpacking Seminar. It is usually held at their lodge in the Columbia Gorge, but sadly not this year due to the fire. Good news is that they also have Tyee Lodge at Mt Hood. 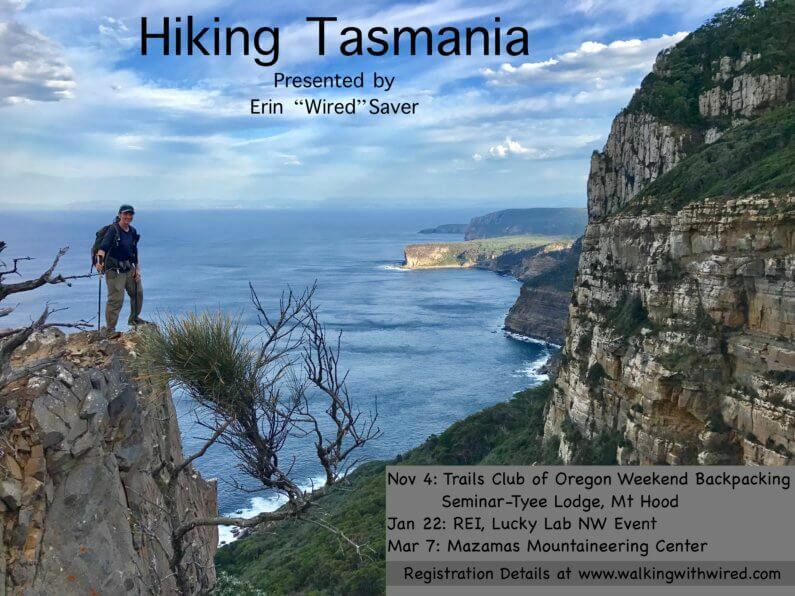 I want to especially point out this event because it is great for anyone looking to get into backpacking and learn more while hanging out with other interested in the outdoors. My friends Drop-N-Roll and Allgood will also be there presenting along with many others on various backpacking topics. There’s hiking, great food, lodging or camping options, a chance to see some lightweight gear, and a raffle with lots of goodies. 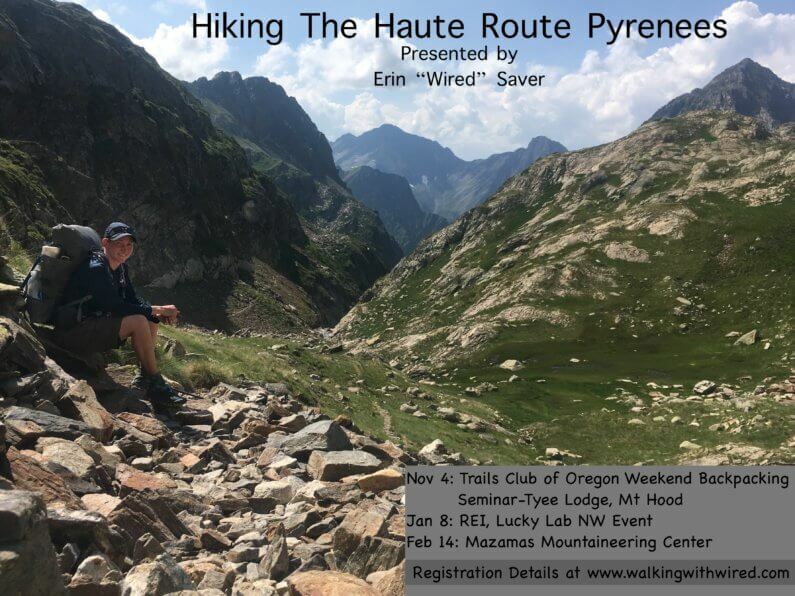 There are still slots available, so contact the Trails Club of Oregon to register! 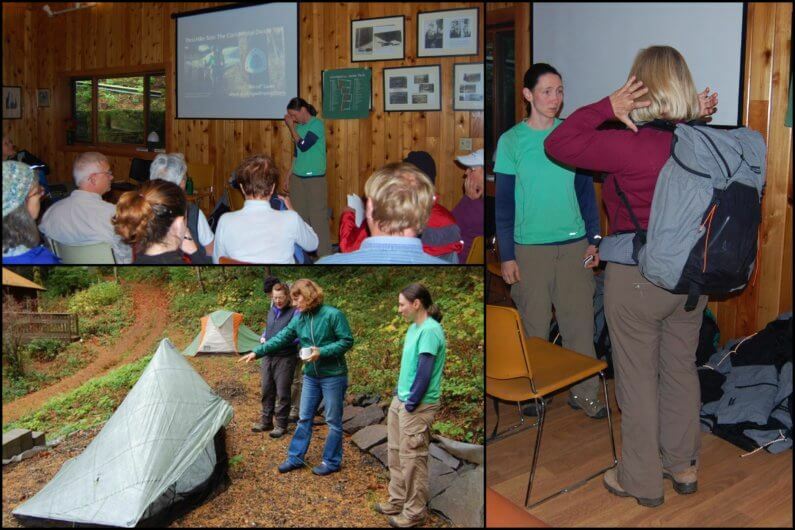 Speaking and testing out gear at the annual Weekend Backpacking Seminar with the Trails Club of Oregon. Love it! Here’s an old clip from my very first Mazamas Presentation. My favorite place to present! I did a lot over the last couple seasons that I’ve yet to present on. Since the presentations are usually volunteer and quite time consuming to put together, I decided to choose two of the hikes from the past year or so and then do multiple presentations of those two, so people can get a chance to see them. I wanted to pick two that were a) Quite different from one another, and b) Trips I could imagine others enjoying regardless of level of experience or length of time. I ended up choosing Tasmania and the Haute Route Pyrenees. Hopefully, one of these dates will work out for those of you interested in those, and I’ll see you soon! Links to register for each one are always on my homepage and at the top of this post. I know many of you do not live in the Portland area, but it’s yet to be feasible for me to take off from my 50-60hr work week to do presentations far from home. Maybe someday something will fall into place for that to happen, but until then, I’ll continue to enjoy my local routine. My favorite presentation to give is my Triple Crown Journey. I’m interested in traveling to give that presentation for groups that are able to cover the costs for travel and lodging along with a speaking fee. If you have an interested organization, just contact me. Hope to see many of you soon! Awesome to see you kicking into a new season. If I wasn’t in SoCal, I’d be there! I think it is great that you can re-experience while inspiring more people..
Erin, I’d love to be there. It’ll be an amazing story minus the cold, the wet, and the ugly because you only get that by doing it. I hope you can still find time in your busy schedule to watch some shows …can´t wait for your Great Himalaya Trail blog! I’ve been so busy the last year I’ve neither had time to closely follow your hiking adventures or do much of my own. Glad to see you are still at it, I’m quietly envious. I mentioned to my wife I’m looking forward to the fourth qtr ending so I can get back in the woods. I told her for XMas I’d like a new Big Agnes sleeping pad as mine has holes i can’t find…her response…do you think you’ll need that on the sailboat? Yea, I’m on the verge of buying a sailboat early next year and setting out to sail the world forever…but I will still need a sleeping pad for hikes into the tropical mountains I told her…Have a good holiday season. Keep putting one foot in front of the other.